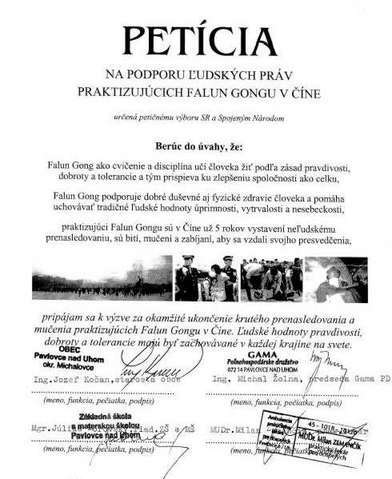 Practitioners of Falun Gong recently wrote mayors of many cities in Slovakia, explaining to them the reasons behind the persecution of Falun Gong in China, the number of victims of this persecution and cruel methods they use to torture practitioners of Falun Gong in China. Many mayors and people in local administrations reacted by signing our petition against persecution of Falun Gong in China. Over 10 cities and villages showed their support. Whereas, practitioners of Falun Gong in China have been subjected to inhuman persecution for 5 years, they are beaten, tortured and killed, in order to give up their belief. I join the appeal for immediate stop of cruel persecution and torture of Falun Gong practitioners in China. Human values of truthfulness, compassion and tolerance are to be maintained in each country on the Earth.